Arcade Video Game published 7 years ago by NAMCO Bandai Games, Inc. Mobile Suit Gundam Extreme VS. Full Boost © 2012 Namco Bandai Games, Incorporated. 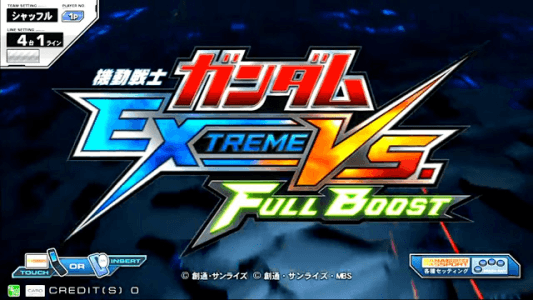 Mobile Suit Gundam Extreme VS. Full Boost was then released on April 05, 2012 in the Japanese arcades. - Some minor changes will be implemented and a new mecha will be added: the RX-0 Unicorn Gundam 02 'Banshee' appeared in the Mobile Suit Gundam Unicorn series and operated by Marida Cruz. It's equipped with 6 different types of weapons. - It adds the CB-0000G/C Reborns Gundam operated by Ribbons Almark and coming from Mobile Suit Gundam 00 series broadcasted between 2007 and 2009. It's equipped with: Egner Whip, GN Buster Rifle, Large GN Beam Saber, Large GN Fin Fangs and Small GN Fin Fangs. - A new stage will also be added: Africa Tower, a battlefield where all the buildings are destroyable. - A new mecha, a new map and a new Navi. The new mecha is the MS-08TX [EXAM] Efreet Custom driven by Nimbus Schterzen coming from Mobile Suit Gundam Side Story: The Blue Destiny trigoly out on Sega Saturn in September 1996 for the first episode, in December 1996 for the second and in March 1997 for the last one. This mecha has three weapons: Grenade Launchers Twin, 6-Tube Missile Pod, Heat Saber and it has also special attacks. - The new map 'Manyupichi' is the same as in Extreme VS. but now the fights take place in the evening. Maureen Kitamura is the new Navi, she also comes from Mobile Suit Gundam Side Story: The Blue Destiny. - New mechas: GAT-X102 Duel Gundam driven by Yzak Joule and coming from the animated series Mobile Suit Gundam SEED broadcast between October 2002 and September 2003. Equipment: "Igelstellung'"75mm Multi-barrel CIWS, Beam Saber, 57mm High-energy Beam Rifle, 175mm Grenade Launcher, Hyper Bazooka, "Shiva" 115mm Railgun, 220 mm 5-barrel Missile Pod, Shield. Cost: 1000 pts. -New mechas: GX-9900 Gundam X driven by Jamil Neate and coming from the animated series After War Gundam X broadcast between April and December 1996. Equipment: Satellite Cannon, Shield Buster Rifle, Large Beam Sword, Torso Vulcan, Beam Rifle. Cost: 2500 pts. - New stage: urban zone over the Earth Federation military base of Torrington located in Australia. - New boss available in D route: AMA-X7 Shamblo, an amphibian gundam from Neo Zeon and coming from the animated series Mobile Suit Gundam Unicorn released in 2010. Equipment: Mega Particle Diffusion Gun, Quad Missile Launcher, Triple Claw with Anti-beam Coating, Remote Control Arms, Reflector Bit. - RX-105 ? Gundam is the new gundam added in this update. It's operated by Mafty Navue Erin (Hathaway Noa) and coming from a series of series of three novels named Mobile Suit Gundam: Hathaway's Flash. Its costs 3000 pts and is equipped with Beam Saber, Funnel Missiles, Mega Beam Cannon, Missile Launcher, Sand Barrel, Beam Rifle, Shield and Missiles. - Two new navi will also be added : Elpeo Ple coming from Mobile Suit Gundam ZZ (anime aired between 1986 and 1987) and Soma Peries from Mobile Suit Gundam 00 (anime released between 2007 and 2009). - A new gundam and its pilot: The XXXG-00W0 Wing Gundam Zero operated by Heero Yuy. They come from Mobile Suit Gundam Wing anime series released between April 1995 and March 1996. Gudam is equipped with: 2 x Beam Saber, 2 x Machine Cannon, Piledriver Shield, Twin Buster Rifle and 2 x Wing Vulcan. The MA-08 Big Zam from Mobile Suit Gundam anime series released in 1979. - A new map taking place in the Sanc Kingdom also coming from Mobile Suit Gundam Wing. - A special Christmas campaign available from December 13 to January 15. Registered players will have access to special events and will receive exclusive items. - MBF-P01-ReAMATU Gundam Astray Gold Frame Amatsu operated by Rondo Gina Sahaku and coming from Mobile Suit Gundam SEED Astray, a manga in 3 volumes released between September 2002 and October 2003. Equipment: "Igelstellung" 75mm multi-barrel CIWS, Type 70 Beam Saber, "Maga no Ikutachi" Energy Absorption Claws, "Magashira no Hoko" Harpoons, "Trikeros Kai" Armed Shield System (50 mm High-Energy Beam Rifle, Beam Saber, 3 x "Lancer Dart" Hypervelocity Kinetic Energy Penetrator), Type 71 Beam Rifle. - AMX-011S Zaku III Custom operated by Mashymere Cello and coming from Mobile Suit Gundam ZZ, an anime series in 47 episodes broadcasted between March 1986 and March 1987. Equipment: Beam Rifle, 30mm Vulcan gun, Beam Gun/Beam Saber, Hide Bomb dispenser, Optional Shield/Weapons Rack, External propellant tanks.